Enjoy 20% off the monthly subscription rate of SingTel's SuperLite and Lite plan. 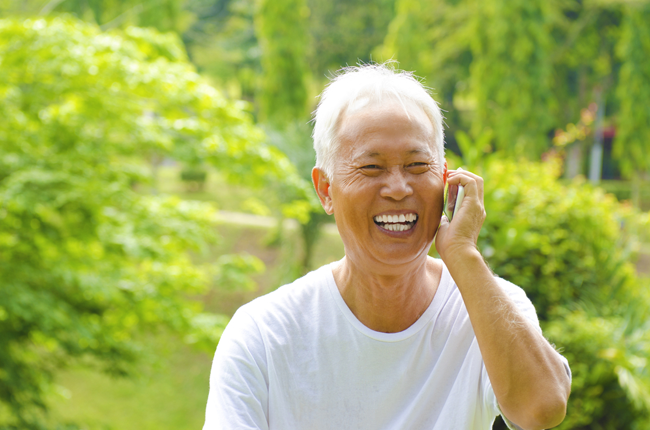 For customers who are 55 years and above, surf the internet anytime, anywhere with SingTel's discounted price plans that come with local data usage. Discover the benefits of digital communications, apps and multimedia content on-the-move! Simply sign up at any SingTel shop or SingTel Exclusive Retailer by presenting your senior citizen pass or NRIC. Data Bundle: Excess local data usage is charged at the rate of $10.70/GB and capped at $188/month. To enjoy more data at great savings, subscribe to DataMore Add-On. Click here to find out more. Free 2GB Store & Share: Click here to download Store & Share app and register. Free Local Calls/SMS/MMS are for usage within Singapore to any local mobile number. To ensure that the activities of some users do not impair the ability of SingTel's customers to have access to reliable services, this service is for personal and non- commercial purpose only, and is conditional on fair usage by customers, capped at 10,000 minutes and/or 50,000 SMS/MMS. SingTel's services should not be used in a manner that unduly interferes with the use of SingTel Mobile’s network or systems. SingTel Mobile reserves the right, without notice or limitation, to levy prevailing charges on usage in excess of cap, or to deny, terminate, end, modify, disconnect, or suspend service if an individual engages in any of the prohibited voice or messages uses detailed at www.singtel.com, or if SingTel Mobile, at its sole discretion, determines the action is necessary to protect the network from harm or degradation. New Mobile plan customers will enjoy free Pay-As-You-Roam and free Voicemail (24-months). *Typical download speed is the typical range of download speed that the user can experience 80% of the time, over a 24-hour period at various locations with 4G outdoor coverage, including Orchard, City Hall and Shenton Way. The speed range may vary between users and is subject to device users and is subject to device used, hardware and software limitation, network coverage/traffic, distance between user and base station, nature of built-up area, source of website and other external factors. Please visit here for more information.